Honor, which is known for launching smartphones in unique colour options today announced the launch of a new Ultraviolet colour variant of the Honor Play. Early in August this year, Honor launched the device in two colour options- Midnight Black and Navy Blue, but from October 3, the smartphone can be purchased in a new colour option- Ultraviolet. While Honor’s colour variants are widely praised across the industry, the same doesn’t go with the company’s naming though. The Ultraviolet colour variant of the Honor Play looks more like a Pink colour, but again, Honor is calling it Ultraviolet. The Honor Play was an instant hit for the company as it offered specifications which are unknown at the price point of Rs 19,999. However, it was quickly overshadowed by the Poco F1 which offered even better specifications at a similar price point. The Honor Play sports a 6.3-inch Full HD+ display on the front, carrying a resolution of 1080×2340 pixels and 19:9 aspect ratio. The phone even has a notch on top of the display, which allowed the company to offer a screen-to-body ratio of 89%. Under the hood, the Honor Play has the Kirin 970 chipset, clubbed with 4GB/6GB of RAM and 64GB of internal storage. There’s a dedicated microSD card slot as well for storage expansion. As for the connectivity options, the Honor Play has Dual 4G, VoLTE, Wi-Fi 802.11 b/g/n, Bluetooth 5.0, GPS and USB Type-C port at the bottom. The fingerprint scanner on the Honor Play is placed on the rear side. Optics on the Honor Play include a 16MP primary shooter on the rear which comes paired with a 2MP depth sensor. On the front side, the phone has a 16MP shooter. The rear camera offers 4K video recording, but it doesn’t have any Electronic Image Stabilisation support. But at Full HD video recording, the Honor Play offers both EIS and AIS support. The phone comes laden with Android 8.1 Ore-based EMUI 8.1 which is one of the heavily customised Android skins out there. Lastly, the phone is armed with a 3750mAh battery along with fast charging. The Huawei sub-brand has launched the new Ultraviolet colour option in just the 4GB RAM variant and it will be available for purchase at Rs 19,999. 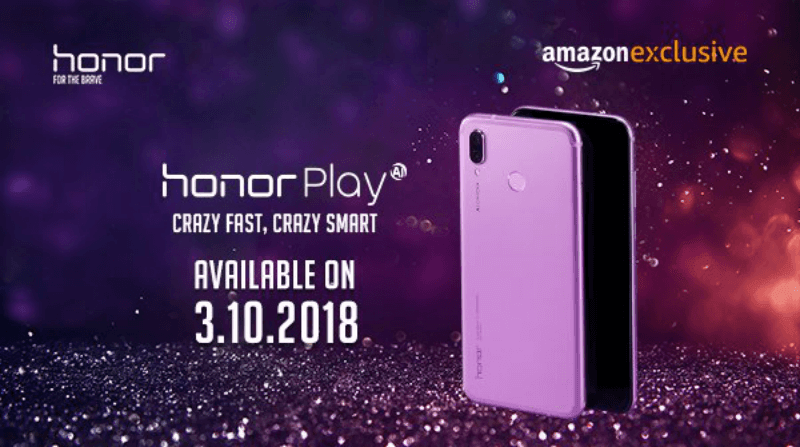 Like the other two colour variants of the Honor Play, the new variant will also be available for purchase on Amazon India starting October 3. Due to the heavy demand, Honor launched the device under the flash sale model, but later on, it made the 6GB RAM variant available via open sale at Rs 23,999. At the moment, both the 4GB/6GB RAM variants of the Honor Play are available via open sale, again thanks to the popularity of Xiaomi Poco F1.